The monumental Ring of the Nibelung (Ring Cycle) is Richard Wagner’s supreme operatic masterpiece. Written over the span of 30 years, Wagner’s epic saga is made up of four instalments: Das Rheingold, Die Walküre, Siegfried and Götterdämmerung. Under Music Director Jaap van Zweden, the Hong Kong Philharmonic Orchestra (HK Phil) embarked on a historic four-year journey, starting in 2015, to complete the entire Ring Cycle, performing one instalment annually in concert, together with a stellar cast of the Wagnerian vocalists and three choruses. Altogether the Orchestra gave eight performances of the Cycle's four parts with a total audience numbering almost 13,000. This venture also attracted over a hundred members of the media, and numerous highly complimentary reviews were generated. With support from the Contestable Funding Pilot Scheme of the Home Affairs Bureau, the HK Phil is proud to present a series of free symposia and related activities led by scholars and experts. Associated with the concert performances, these activities aimed to enhance audience's understanding and appreciation of Wagner’s work, and the Ring Cycle in particular. Wagner expert Sue Elliott and Professor Liu Ching-chih, together with the HK Phil musicians, led you to embark on an extradordinary Ring journey via a series of podcasts. The first-ever opera-in-concert performance of Wagner’s epic Ring Cycle in Hong Kong, this four-year journey is also the first to be recorded and released on CD by an orchestra from Hong Kong. Released on the Naxos label, the first three parts have been a huge success with audiences and critics alike. The live recordings of the HK Phil’s Ring Cycle parts one Das Rheingold, two Die Walküre and three Siegfried are now available on CD/Blu-Ray in local record stores. The last recording, Götterdämmerung and while a CD box set of the entire Ring Cycle will be released at the end of November 2018. Wagner Ring Cycle Box Set with a USB stick which contains the English and German libretti for all four operas, concert photos and interview videos. A discount is granted on all physical titles (i.e. CD and Blu-ray audio) in the Ring Cycle – Das Rheingold, Die Walküre, Siegfried, Götterdämmerung – as well as on the 14-CD box set, which will also be released at the end of Novemeber 2018. This offer is exclusive to all HK Phil Club Bravo members, and any audience members who attended the Ring concerts. Please note that the redemption period for this offer expires on 31 January 2019. * Shipping and handling fees are not included in the prices above. There are two ways to redeem this offer. Visit the Naxos sales booth at any one of the following six concerts at the Hong Kong Cultural Centre. You will need to show your HK Phil Club Bravo membership or a photo of the original Ring concert ticket stub. Accepted forms of payment are cash, credit card, Apple Pay or Android Pay. If you are not planning to attend any of the concerts listed above, you may also email Naxos at order1@naxos.com.hk to place your order, indicating which titles you would like to purchase and quantity for each title. Please attach an image of your HK Phil Club Bravo membership or a photo of the original Ring concert ticket stub to the email. Once your order has been processed, you will be notified by email, and may then arrange to pick up your order at the Naxos warehouse in Kwun Tong. Payment must be made in person by cash, credit card, Apple Pay or Android Pay. In case courier service is needed, shipping and handling fee will be charged by Naxos. Thank you for your support of the HK Phil. We hope you will enjoy this offer. For any additional questions about this offer or individual recordings, please contact customer.service@naxos.com. • The special discount offer is only valid for purchases made by the above mentioned ways. • The special discount offer is only valid for all physical titles and the CD box set of the Ring Cycle. • The special discount offer expires on 31 January 2019. • The special discount offer is not redeemable for cash, any merchandises or services. • By purchasing the above mentioned merchandises, you accept and agree to be bound by this Terms and Conditions. • The Hong Kong Philharmonic Orchestra is not the supplier of the special discount offer mentioned. Any enquiries or complaints in relation to the products and services provided should be made to the relevant supplier (i.e. Naxos) directly. • Only HK Phil Club Bravo members and the Ring concert ticket stub holders are eligible for the special discount offer mentioned. The Hong Kong Philharmonic Orchestra disclaims responsibility for any lost concert ticket stub. • The Hong Kong Philharmonic Orchestra reserves all rights of final decision in case of any disputes. To introduce Wagner’s music and the epic Ring Cycle to the Hong Kong public, the HK Phil invited Wagner expert Ms Sue Elliott to host a symposium. Conductor Jaap van Zweden and the numerous vocalists during the applause of the Das Rheingold. Ring partner Chow Sang Sang specially created the Ring necklace for this project. The three Rhinemaidens in Das Rheingold, performed by (from left) mezzo-sopranos Hermine Haselböck and Aurhelia Varak, and soprano Eri Nakamura. Conductor Jaap van Zweden, together with tenor Matthias Goerne (Wotan) and soprano Petra Lang (Brünnhilde), during the applause of Die Walküre. The love story of Sieglinde (by Heidi Melton) and Siegmund (by Stuart Skelton) captivated the hearts of the audience. The Valkyries sisters met and gave a compelling performance in the third act of Die Walküre. Illustrations of our cast members by local illustrators were displayed during the “Activity Day” prior to Die Walküre, alongside a demonstration of Wagner brass instruments at the foyer. In January 2017 Jaap van Zweden conducted the third chapter of the Ring Cycle, Siegfried. Soprano Valentina Farcas sang from the choir stall as Woodbird, telling Siegfried (by Simon O’Neill) the plot of Mime. Siegfried and Brunnhilde proclaims their love in the phenomenal duet in the last act of Siegfried. Tenor David Cangelosi played Mime in Siegfried. The protagonist Siegfried was played by New Zealand tenor Simon O’Neill. As in previous years, the HK Phil invited Wagner expert Ms Sue Elliott to host a symposium to introduce Wagner’s music and The Ring to the Hong Kong public. In January 2018 Jaap van Zweden led the HK Phil, together with a stellar of Wagner vocalists and the Bamberg Symphony Chorus, Hong Kong Philharmonic Chorus and State Choir Latvija in the final chapter of the Ring Cycle, Götterdämmerung. Tenor Daniel Brenna as Siegfried (left) and soprano Gun-Brit Barmin as Brünnhilde. Bass-baritone Shenyang as Gunther (left) and bass Eric Halfvarson as Hagen. Chief Executive Michael MacLeod, the docent for the Ringers in the Ring exhibition. Demonstration of a Wagner tuba by a HK Phil horn player Russell Bonifede. 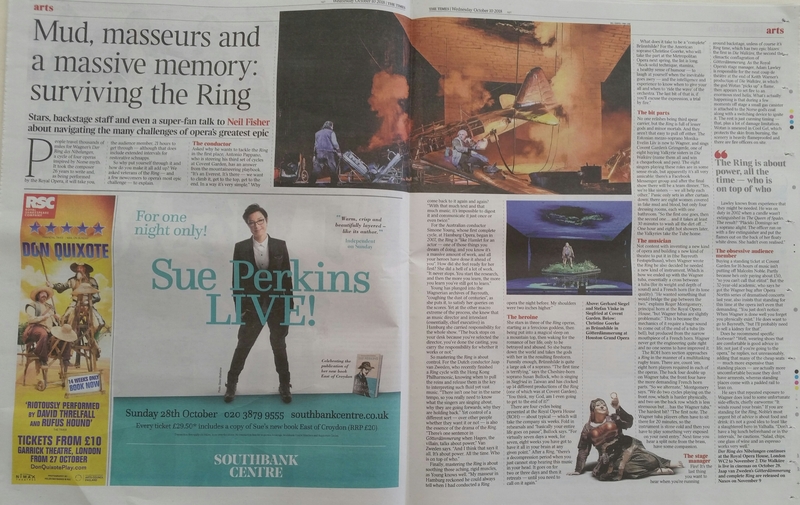 Wagner expert Sue Elliott was invited to speak on the Götterdämmerung Discovery Day. "Reaching the pinnacle of perfection… The achievement was due to Jaap van Zweden's determination to make music at the highest level instead of sensational stage effects. He took the HK Phil to the next level. It is not only a blessing to the HK Phil but also to all fans in Hong Kong."